We are pleased to announce the appointment of Bernarda Fink as Lecturer in Voice in the fall of 2019 in the Yale School of Music and Institute of Sacred Music. Ms. Fink will take up the teaching duties of Prof. Jimmy Taylor during his sabbatical leave. Bernarda Fink is one of the most sought-after singers in concerts and recitals. Acclaimed for her musical versatility and invited by the leading orchestras and conductors in Europe and America, her repertoire ranges from ancient to contemporary music. 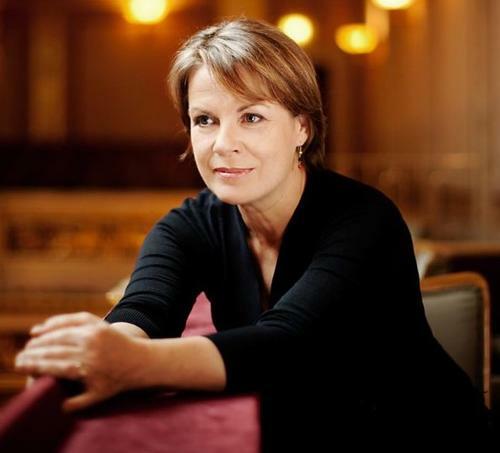 She frequently appears with such well-known orchestras as the Vienna and Berlin Philharmonic Orchestras, Royal Concertgebouw Orchestra, Staatskapelle Berlin and Dresden, and the Cleveland Orchestra. Ms. Fink has also worked with most of the best-known conductors in the world, and had a close artistic cooperation with Nikolaus Harnoncourt, as evidenced by numerous TV and CD recordings. Bernarda Fink has an impressive discography with more than fifty releases ranging from Monteverdi and Rameau to Schubert and Bruckner and Schumann; many of them have been awarded coveted prizes such as the Diapason d’Or or the Grammy. Recent recordings include Bach Cantatas with the Freiburger Barockorchester, Lieder by Schumann with accompanist Anthony Spiri, Pergolesi’s Stabat Mater with the Akademie für Alte Musik Berlin, and programs with lieder by Slovenian and Argentinian composers together with her brother, the baritone Marcos Fink (Grammy nomination). We all greatly anticipate Bernarda Fink’s arrival at Yale in the fall, as we wish Prof. Taylor well on his sabbatical leave.